Davis Hong, General Manager will sit with you to plan your next party. We transcend the norm of Asian Cuisine in Charleston by fusing new innovative and interactive art of Korean barbeque right at your table. Watch as your meat, vegetable, and seafood sizzle and caramelize before your very eyes. 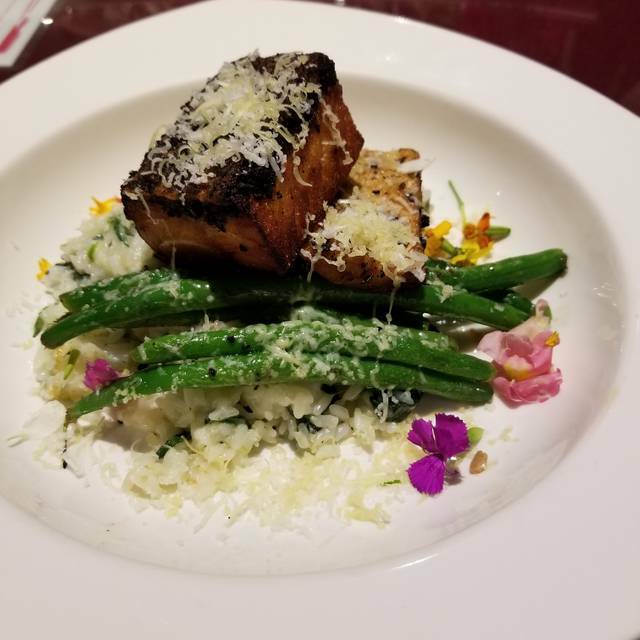 We want to offer you an experience you will truly never forget, with an array of complex flavors that will give your palate a new perception in taste. We also offer beautiful edible sushi unparalleled, crafted by chefs who have devoted their lives to the art of sushi. Ask your server for daily sushi special! Add a bottle of Soju for Only $10! The food is simply amazing and a very good value for you money however, one star was lost to cleanliness and waiting times. My first time there and the server was very helpful and nice. Had an excellent time at 843. 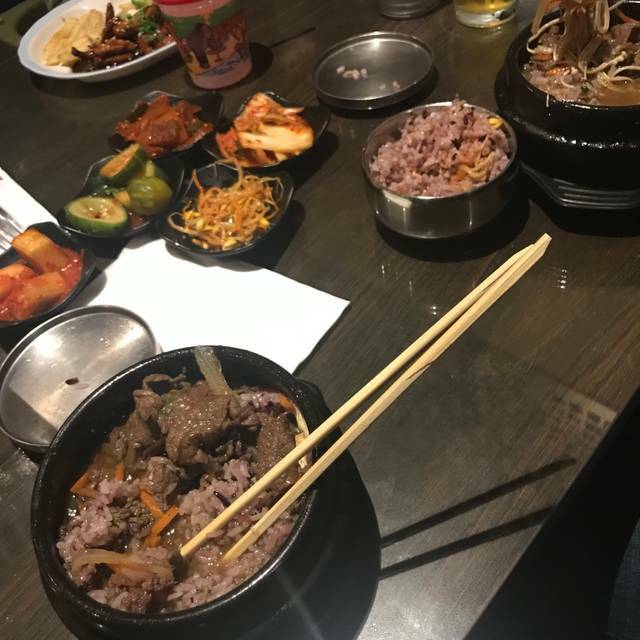 It was our first time ever trying Korean BBQ and we are from out of town. We had some trouble getting seated (got moved twice), but once we sat down, Jimmy was a great server/cook. He was personable and very knowledgeable. Would definitely visit again whenever we come back to Charleston. Also, my partner said the prickly pear punch was great! 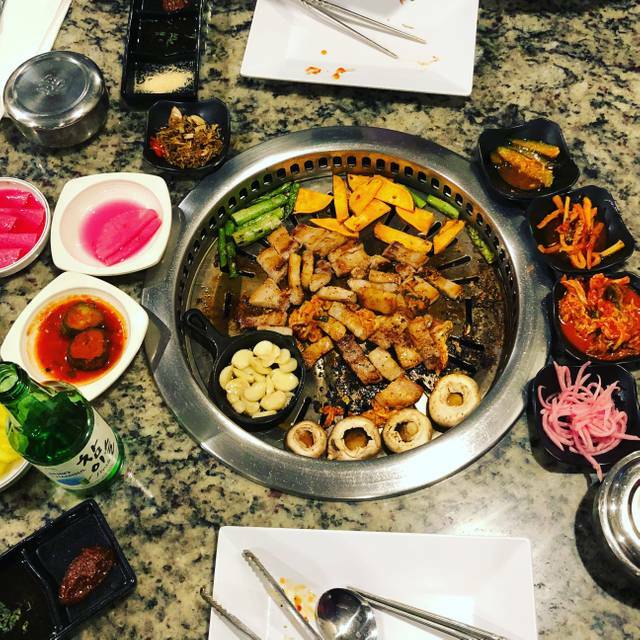 We were thoroughly impressed with 843 Korean BBQ. Our server Gigi was great! She was very attentive and didn't mind answering the many questions we had as it was our first experience. We would definitely recommend. Well worth the price paid. We always enjoy our visits at 843! The service is excellent and attentive! The food is always delicious! The portions of food is always large and take-home boxes are always necessary! 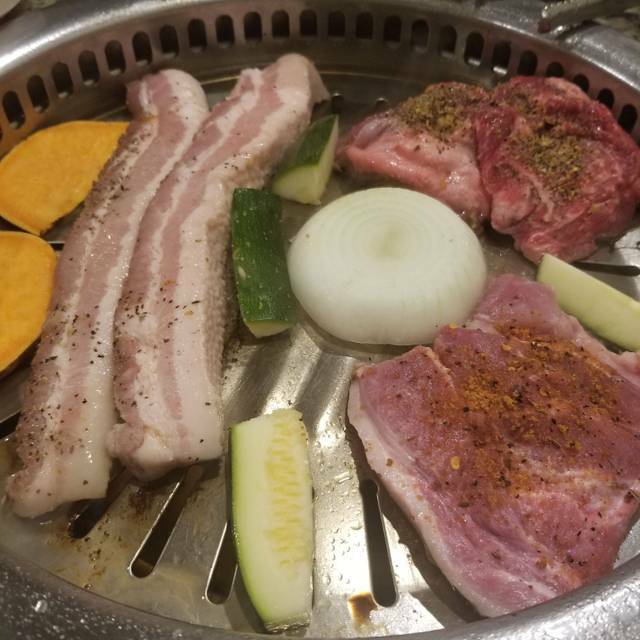 This was our first time doing Korean BBQ and can’t wait to go back. The best service and so helpful with the cooking process and how to order. A special shout out to Liz that guided us through this experience. Don’t hesitate to make a reservation for 2 or more and be assured you will love it. Sushi was awesome, brisket had way to much fat on it and was hard to chewy. First time eating at a Korean BBQ restaurant. Delicious food and a lot of it! We will plan to come again. Thank you! Great service! Delicious food! Our server did a great job with explaining and suggesting menu options that worked best for our party of 4 experiencing the Grill Room for the first time! Will absolutely be back! Awesome service !!! Thet really went above and beyond! My girlfriend and I have been here previously with a fantastic experience this time not so much. We made the reservation online and were seated very quickly. Very shortly after being seated I overheard what appeared to be maybe two hostess discussing how we didn’t have a server. One of them came over after walking away and told us a server possibly Ms. Janet or Janice would be our server for the evening. We had already been waiting a while so we placed our orders with her which was the BBQ essentials and Rivers Ave sushi roll. We had no interaction from other members of the staff for over 20 minutes. We were gathering our things to leave because the only thing we had received was the water. The hostess not server came over and explained sushi was half off and the chefs were backed up causing the delay. I was empathetic to that but upset I was not made aware of the special. After noting we had been sitting there for a while she brought out our BBQ and that’s when I served appeared. She rarely addressed up and was putting all the meats on the grill before we were ready. It felt like we were being rushed out even tho the delay was no fault of our own. After this experience I’ve had my fair share. The spring rolls and dumplings were delicious. Unfortunately, we couldn’t get into the Korean bbq room. The waiter was great and knowledgeable. Price tag is high on the Korean BBQ but we’ll worth it. We always enjoy our time at 843! The staff is wonderful and the food is excellent! Good food with extensive menu. Great food and service. Plenty of food and tasty kimchi sides. We loved the home made dipping sauces. The grill is fun. Food is really good. Love the pork belly and sushi! Awesome food and service. One of the most underrated dining experiences in the area! We ❤️ eating Korean BBQ! Whomever makes the side dishes at 843 does an amazing job! It is fun and social to sit down with family and friends at this restaurant while we cook deliciously marinated meats and cut veggies! The sides are definitely one of the main reasons why we return to this fun delicious restaurant! Kimchi Radish and Cabbage; bean sprouts; Fish cake; Bulgogi, spicy chicken! 😋 yum! 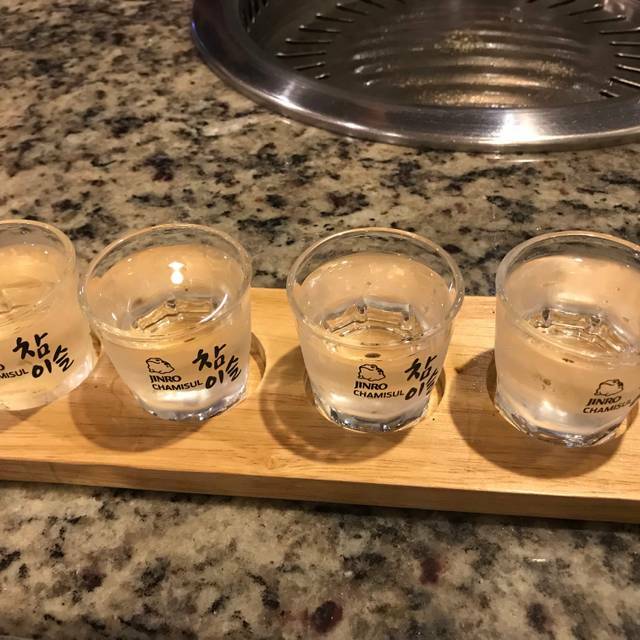 The Soju flight I had on my last visit was delicious and a fun way to find a favorite flavor. Thank you! We will be back! Had a great time hosting a Holiday gathering for my staff. We sat in he dining area next to the beautiful Christmas Tree. We had a group holiday dinner at 843 last night and we all left really impressed and planning on a return soon! I made the reservation through OpenTable but the restaurant called me the afternoon before to confirm, which I thought was a nice touch. When I explained that we had 15 RSVPs but were expecting anywhere from 10-20, they happily worked with me to set the right number of tables. We sat on the bbq side and our waiters (Jeff annnnd I never got the other guy's name) patiently explained the process to the group as people arrived. They also explained the menu to us and gave great suggestions. I would have liked to see more local beers available, but I was happy with what was offered. We ended up with one table of 9 and one table of 4 (and we would have split them more evenly but it worked out) and I felt like we got to taste almost everything on the menu! I don't know if I could have picked a favorite. We realized afterwards that we could have ordered half as much food but we were happy with our choices. After dinner we headed to the karaoke room. My only complaint there was that the books were both organized by song and not my artist (the places I've been before usually have one by song and one by artist) so it was hard to find a few things, but we still sang our hearts out. This was an absolute blast and a perfect location for a group outing. Awesome meal, great service. Had the bulgogi on the bbq side- add lettuce wraps, highly recommend! Awesome food. Great fun. Come hungry because you will want to eat some of everything. Definitely go for the cook your own side. Great fun cooking our own meal and getting to sample so many things. We also ordered sushi as an appetizer and it was very good. Food was really good, make reservation! I will be back! Really awesome food and our server was super nice! I wish I could remember his name! Great food with great service. I always come here for special occasions, and always leave satisfied. The food is very pricey but good. On our visit our server was cooking our pork on the table and then stepped away. He didn’t leave any guidance so we waited for him to come back but then I realized our food was burning. It was still edible but slightly burned. Our grill had to be replaced in order to cook our chicken next due to it being burned. Different, great service. Creative place, assortment of foods. Good Sake. Portion size is nice. Everythimg is very tasty. The staff knows how to prepare the dishes well. The desserts are awsome.